Fall Follies and Yummy Dinner! What an enjoyable afternoon we had! My daughters school musical department is AMAZING! 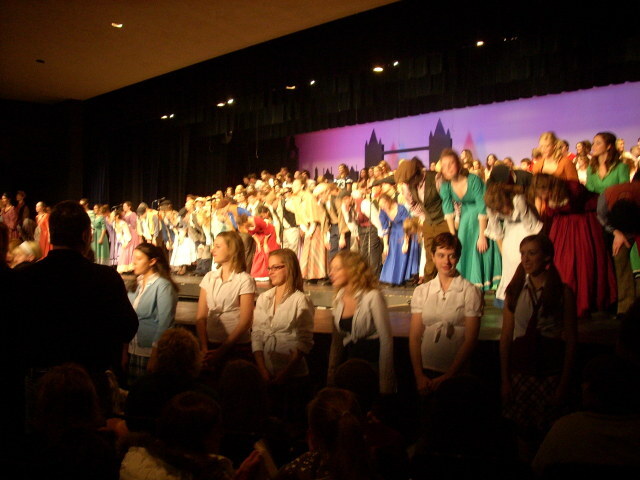 Out of the 2000 kids that go to high school there, 450 kids are in Fall Follies, the first big musical production of the school year. My mom always says that when she sees these performances, she said that if she closed her eyes she would think she’s in downtown Chicago. It really is that good! 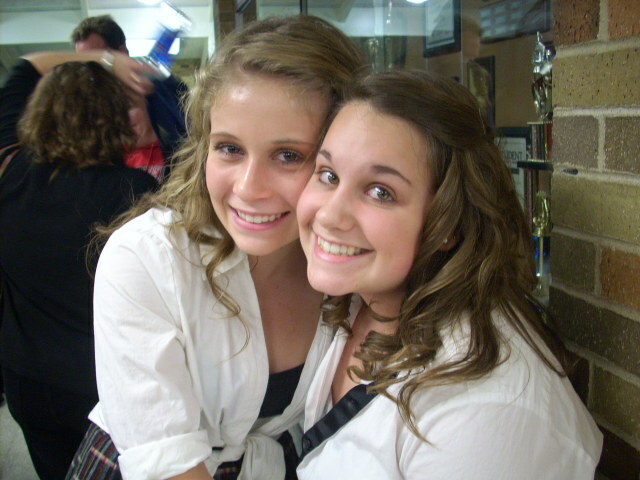 You did a great job Hannah – I am so proud of all your hard work with rehearsals! No photos allowed during the performance, but this will give you an idea of how many kids are in this! 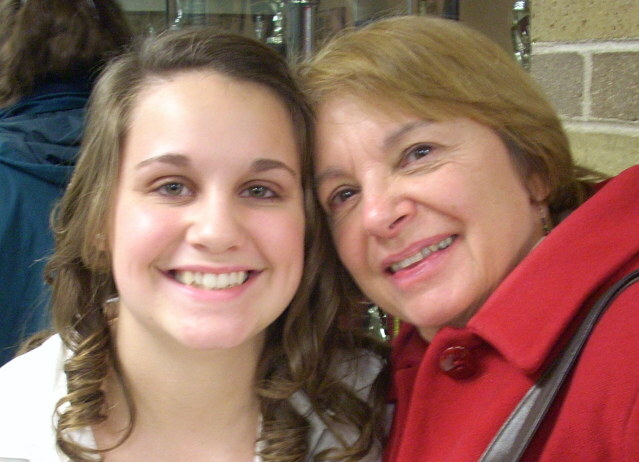 Of course, my mom and I thought that Hannah’s group had the best song – they did a four part harmony A Capella version of Sarah McLaughlin’s Angel that was so good! Then dinner turned out so good. I ended up pounding each chicken breast flat and I thought I was going to roll it, but decided to cut each chicken breast in half and make it like a stuffed sandwich. 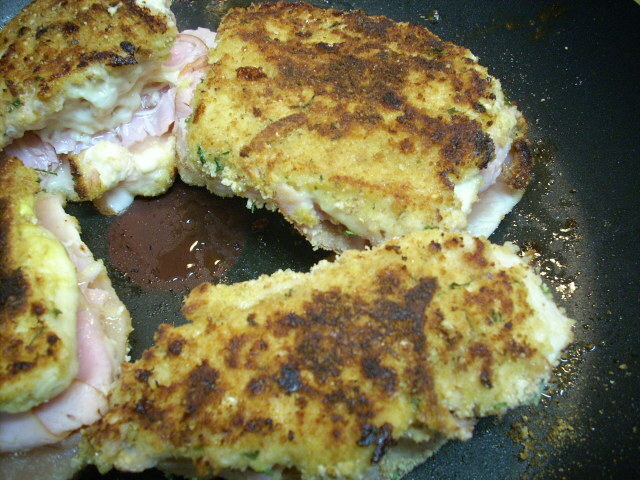 I stuffed the chicken with ham and fontina cheese (so yum!) and dredged in flour, then an egg/milk mixture, then in seasoned bread crumbs. Then I realized (thanks to Tony!) that I couldn’t put my skillet in the oven because the handle is plastic. So any excuse to use my cast iron enameled pot, I transferred the chicken to the stock pot and finished it off at 350 degrees for 20 minutes (with the top on). I didn’t overcook the chicken! It was really good! 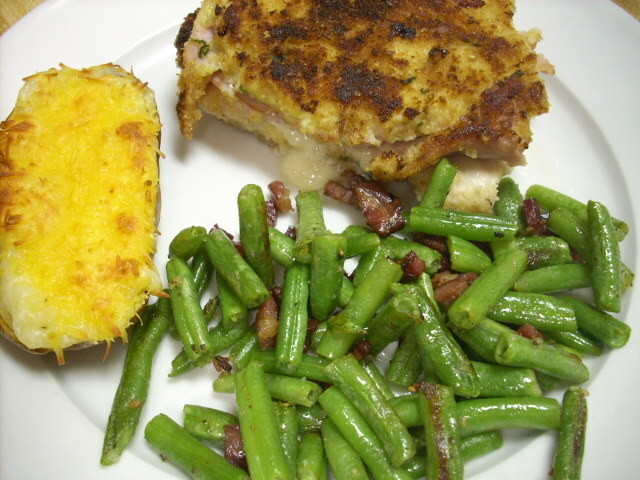 I served it with twice baked potatoes and pancetta green beans. Thanks too for my mom for making the one hour trip one way to see this performance. It’s always nice to have her over – and she’s coming over for Thanksgiving so I’ll see her again in a few days! She’s bringing sugar free pumpkin pie – yum! Off to watch t.v with Tony – Entourage will be on soon. See you at breakfast!